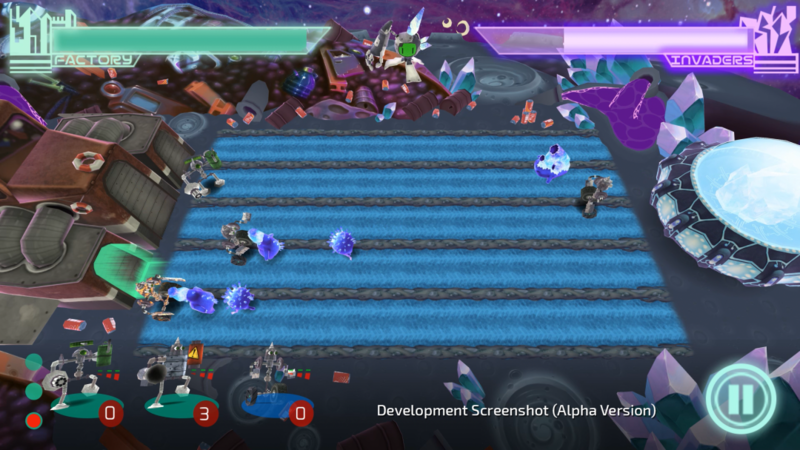 Customize Robots To Defend And Destroy! The aliens known only as Tham have only one goal – to take back their crystals and destroy anything in their way! They arrive using strange spaceships and attack in swarms of unusually straight lines – you won’t last long unless you can learn to block their attacks with your robot creations. Mix and match parts to create the best robots for every situation, but be careful – these robots are made out of junk after all. Unstable robots can malfunction at the worst times – or perhaps even provide an unexpected advantage! The aliens won’t stop until they are all defeated, but you may be able to end the battle early by going on the offense and attacking their spaceship. Of course, each battle is only a small part of the war – many levels and worlds await you in your quest to rescue your mentor. The crystals that rained down on your junkyard have infused all of the salvaged materials with a strange life force – all you need to to do is assemble robots from the parts and they’ll march forward and fight the aliens on their own! You’ll need to choose four parts for each robot: a head, a chassis, a weapon, and a pair of legs or wheels. You won’t be able to build every part right away and they each have their own advantages and disadvantages, so it’s up to you to master them all!